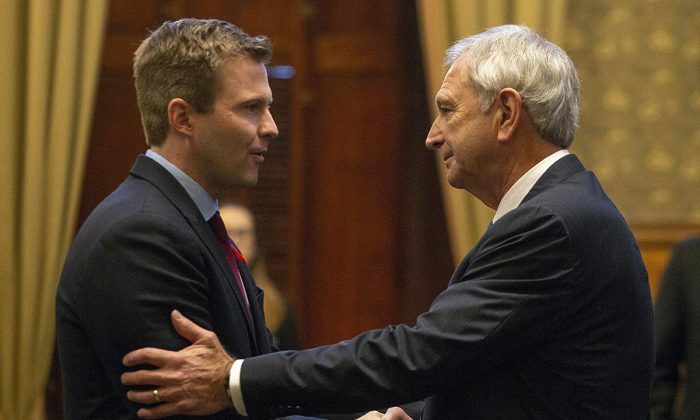 Higgs had promised to cut government waste and balance the province’s budget in two years—a year earlier than his outgoing rival, Liberal premier Brian Gallant. “We will set lofty goals and achieve them. We don’t need more taxes, we need results,” Higgs said on Nov. 2, after Gallant’s government fell on a confidence vote. The company is one of the province’s largest employers, with interests in forestry, pulp and paper, transportation, oil refining and distribution, retail, media outlets, and shipbuilding. Canadian Business magazine says the privately owned empire was thought to be worth $7.8 billion, making the Irving family the eighth richest in Canada. Before the election campaign began, the Liberals took aim at Higgs’ business background, saying he has opposed minimum-wage increases, income tax increases for the richest New Brunswickers, and a plan to make tuition free for some post-secondary students. And it’s been that way since Higgs was growing up in Forest City, N.B., near the Canada-U.S. border. The son of a customs officer, he married his high school sweetheart, Marcia, and settled down in Saint John, where they had four daughters: Lindsey, Laura, Sarah, and Rachel. First elected to the New Brunswick legislature in 2010—four months after he retired from Irving—he served as finance minister for four years. He was elected as Tory leader in October 2016. “Based on [Higgs’] rhetoric, he could become another thorn in the side of Trudeau, especially when it comes to natural resources,” Lewis said. Economic growth—forecasted by the Conference Board to be about 1.3 percent this year—is expected to remain sluggish as the province struggles to increase its population.